The Watering Hole. Photo courtesy of the Philadelphia Zoo. The beer and food menu can be seen here. 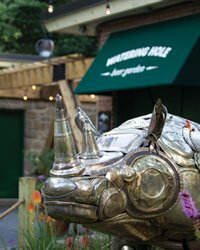 Open Friday through Sunday, 11am to 4pm, The Watering Hole will be a nice addition to the always enjoyable Philadelphia Zoo. This entry was posted in Uncategorized by Thebrewholder. Bookmark the permalink.